Tattoos have gained popularity during the last decade, and both the younger generation and adults are under their influence. If everything is clear with the healthy skin – there are no special contraindications, then how to be those who have psoriasis? Possible complications. The skin of those who suffer from psoriasis is sensitive enough: creams, scratches or chemicals that are absolutely harmless to a healthy person can cause irritation. There is a high probability of new plaques appearing on areas not affected by the disease. In medicine, such cases are diagnosed as a Kebner phenomenon, i. e. at the site of external damage, a reaction occurs that is typical for a given type of dermatological disease already observed in the patient. Stage of exacerbation. 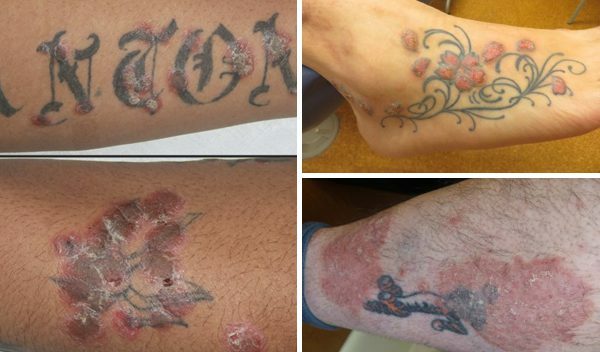 Doctors assure that during the acute stage of the disease the concepts of “psoriasis” and “tattoos” don’t go together. Otherwise, the patient’s condition may worsen. Unaesthetic appearance. Not only the medic, but also the common man will say that the drawings on the body with psoriasis are strange ornaments, they rather repel and emphasize the existing problem. Fears of others. Not every tattoo master will agree to draw a tattoo on a person with such a disease. A small percentage of workers in this field have a medical education, so they do not understand the skin diseases and how they are transmitted. Choose the period of remission. For a campaign to the master it is better to notice such time when the illness will weaken slightly. So the body will easily bear the stress, and the number of further complications will be minimized. Go for a medical examination. Those doctors who support tattooing should conduct a preliminary examination to ensure that the skin is ready for the procedure. Choose a reliable salon and provide a certificate. Before getting a tattoo, it is necessary to be convinced in qualification of the master: to take a look at the certificate. To neutralize the negative background, you should prepare him – show a certificate from a doctor and tell him about the ways of transferring psoriasis. And so, there are opinions “for” and “against” drawing tattoos on the skin of patients with psoriasis. The first thing to do before visiting a tattoo artist is to go to a dermatologist. It is he who can make a verdict for a particular case and give advice on drugs to mitigate the effect after the procedure and for rapid healing. British singer Amy Winehouse, who had more than 10 tattoos on her body, suffered from psoriasis.